This cheat sheet will prevent you from ordering carnitas when you want cabrito. Al pastor: Thinly sliced marinated pork is stacked on a trompo (vertical rotisserie) for cooking. The pork is then sliced off the trompo and finished on a griddle. That last step is required by a nervous health department. Barbacoa: In Texas, barbacoa is usually the meat from a cow head—often only from the cheek (cachete). It is braised to approximate the traditional pit-cooking method. Blame health codes for preventing you from enjoying the real deal. Birria: A heavily seasoned stew, usually made from lamb or goat. Cabeza: Beef head, usually braised or steamed. Carne asada: Grilled beef, usually cut into fajita-style slices. Carne guisada: A beef stew usually consumed in breakfast taco form. Chorizo: Heavily seasoned pork sausage. Masa harina: Dough made from dehydrated corn flour easily found at supermarkets. Maseca is the predominant brand. Suadero: In Dallas, it’s usually brisket cooked in fat that is finished on a flattop griddle. Trompo: The northern Mexican style of taco al pastor. Its marinade is heavy on the paprika. With myriad options, we thought it useful to offer a primer on the flatbreads that form the foundation of the world’s perfect food. First, there’s the fact that tortillas aren’t limited to corn (of any color) or white flour. Some Dallas tortillerias, such as the La Nueva chain (pictured), mix in chiles and other ingredients. Araiza Tortilla Factory, purveyor of the city’s best corn tortillas, begins the process with nixtamalization. That’s where we start, too. The corn tortilla is the most important of taco bases. Corn plays a role in Mexican creation stories and is so critical to Mexican identity that, it’s said, without it there is no Mexico (sin maíz no hay país). Corn tortillas are traditionally made via nixtamalization, a millennia-old process of soaking and cooking corn in an alkaline solution (slaked lime and ash) to loosen the kernel’s hull and imbue the food with nutrients. The corn is then ground and formed into corn dough (masa) that is made into fragrant, rich tortillas. 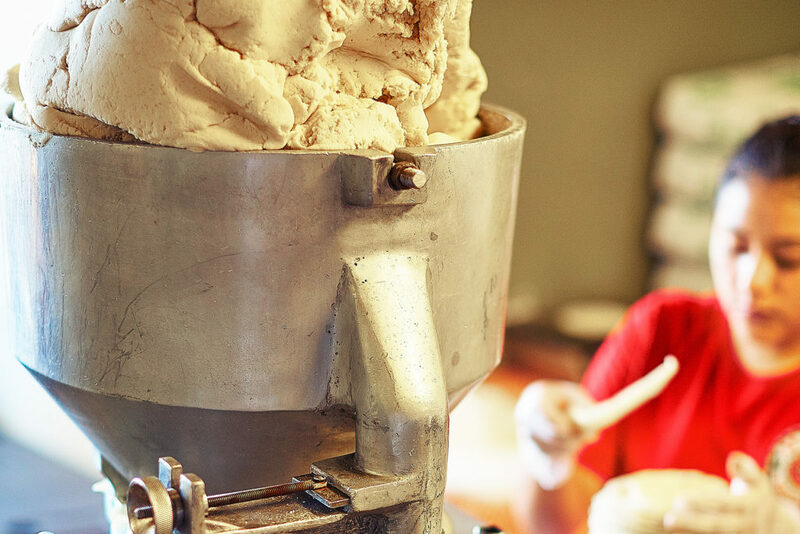 The problem is that nixtamalization is so laborious and time-consuming that it can significantly increase the cost, which is why the commodity tortilla, a chemical-flavored, preservative-stabilized disk coaxed from dehydrated masa, has become the standard. Many tortillerias (tortilla factories) prepare tortillas from powdered masa from brands like Maseca. We prefer the handcrafted sort. They smell of cornfields and care. 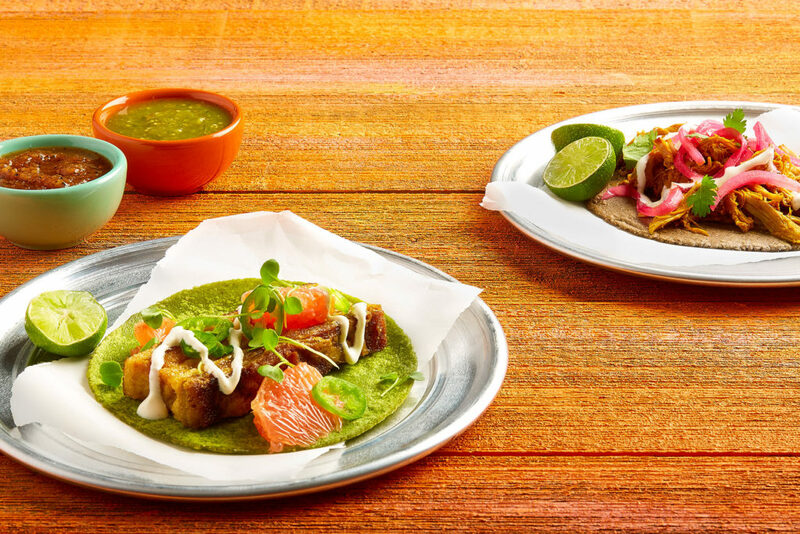 The light clay-colored options made for the crunchy, health-conscious class can be an object of scorn for those who claim unwavering dedication to “real tortillas.” The purists are wrong. As evidence, we point you to Tepeaca, Mexico, in the state of Puebla, where a group of women specialize in these tortillas de trigo. So, the next time your friend scoffs at you for ordering Tacodeli tacos on whole wheat, drop some tortilla history. Often considered unauthentic (whatever that means), flour tortillas were developed from the wheat fields planted during Mexico’s colonial period. They’re typical of northern Mexican states like Sinaloa and Sonora, and the U.S.-Mexico borderlands. They can be made with fats such as beef tallow or shortening. They can be as large as a hubcap or as small as an adolescent’s hand. They can be gossamer in appearance or fluffy in texture. Whatever form they take, when executed well, they’re downright delicious. Not all salsas are created equal. Some can send you rocketing to the heavens with their heat. Others are angelically sweet. So it’s important to put the proper salsa on the fitting tortilla filling. While you’re at it, get rid of the refrigerated squeeze bottles. They’re unsightly, and chilling deadens the flavor.